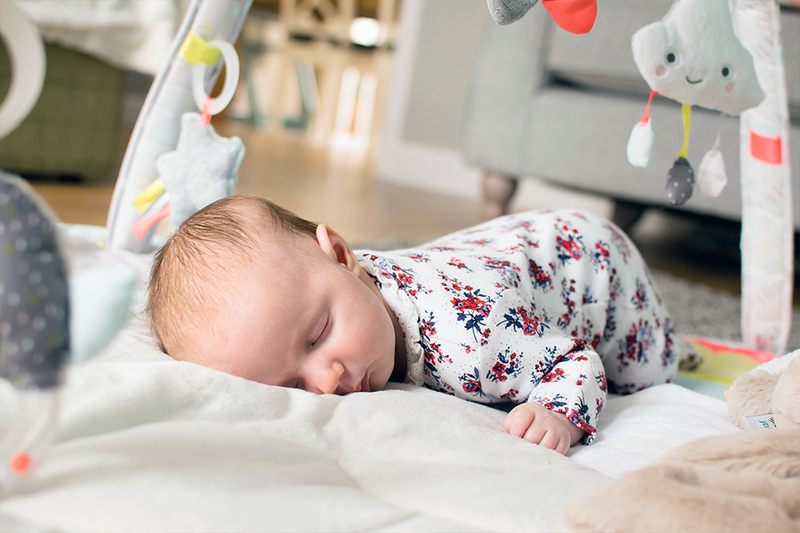 Newborns and play are two things new parents struggle to combine. It often feels like they aren’t able to interact or that they show no interest in what’s around them. Offering small amounts of stimulation is important for their mental and physical development. 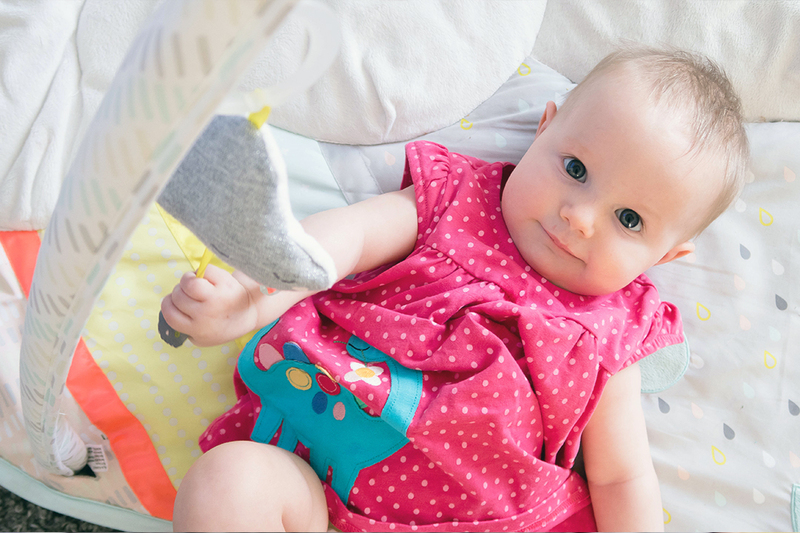 That’s why choosing a good playmat is a great way to ensure you meet your baby’s developmental needs. We were sent the Skip Hop silver linings activity gym for Dolly and she loves it. Not only does it provide her with the stimulation she needs, it also looks good! Baby items have improved in terms of style over the years. You no longer have to opt for bright garish colours if you don’t want to. 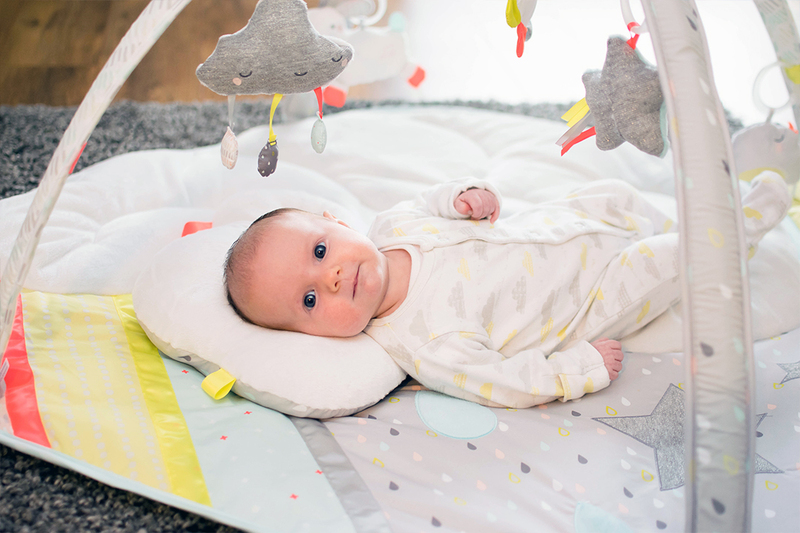 This mat features a soft colour palette to complement modern decor along with pops of bright colours to stimulate baby’s sight. It fits into our home really well and I love the patterns. I just want all of the cute Skip Hop Clouds and baby things in our home, they’re gorgeous! 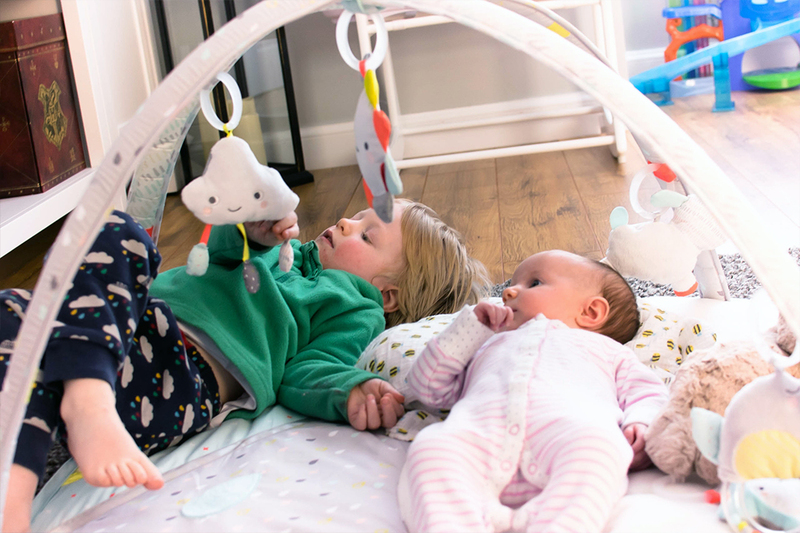 Featuring 5 toys that can be attached at various heights, or taken off for free play, the playmat provides hours of much-needed fun for little ones. Cloud toy with dangly rain drops – Perfect for grabbing, and is possibly Harriets favourite feature. She spends much of her time holding onto these. Rattle bird – This bird toy features a rattling tube. Great for shaking. Or in our case kicking. Sunshine Mirror – The centrepiece of the mat is this mirror that looks like the sun. 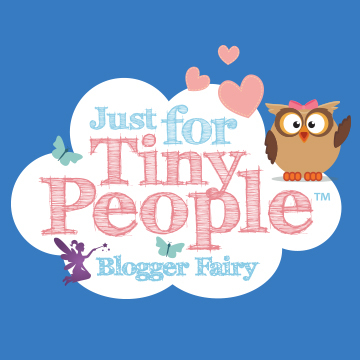 Perfect for a little vanity and fantastic at keeping little ones entertained. Musical Sheep – This cute fluffy sheep plays the tune of “You are my sunshine” when you squeeze it. 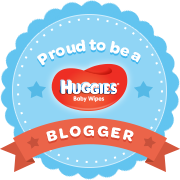 Adding another sensory experience for little ones to enjoy. 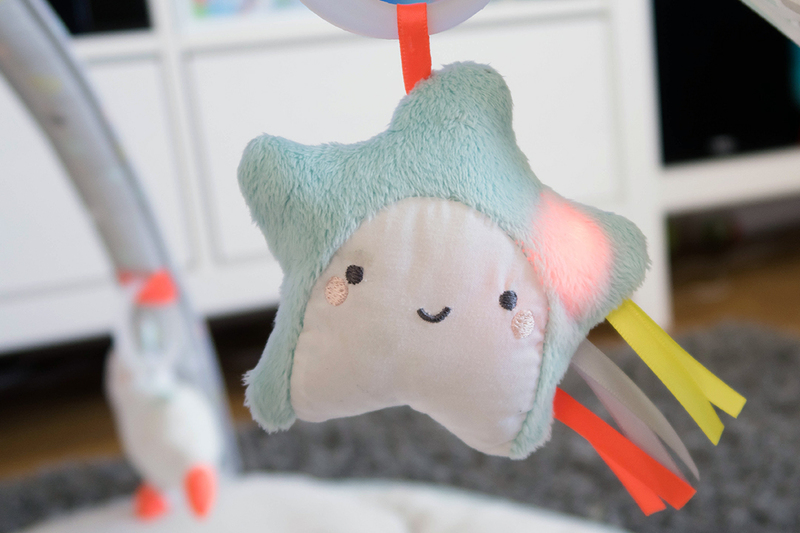 Flashing star – One of my favourites is this cute little star, which has flashing LED lights. We like to turn out the lights to enhance the experience and Harriet really enjoys it. 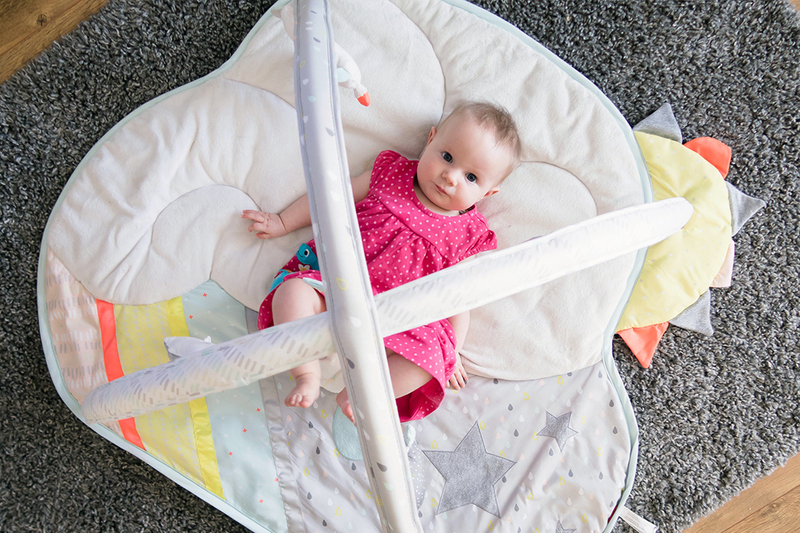 The oversize mat offers cushiony comfort and multiple textures for sensory development. It also comes with a cloud shape cushion for tummy time. When a baby is able to sit unaided you can remove the toy arches and continue to use the mat as a play space so it grows with them. 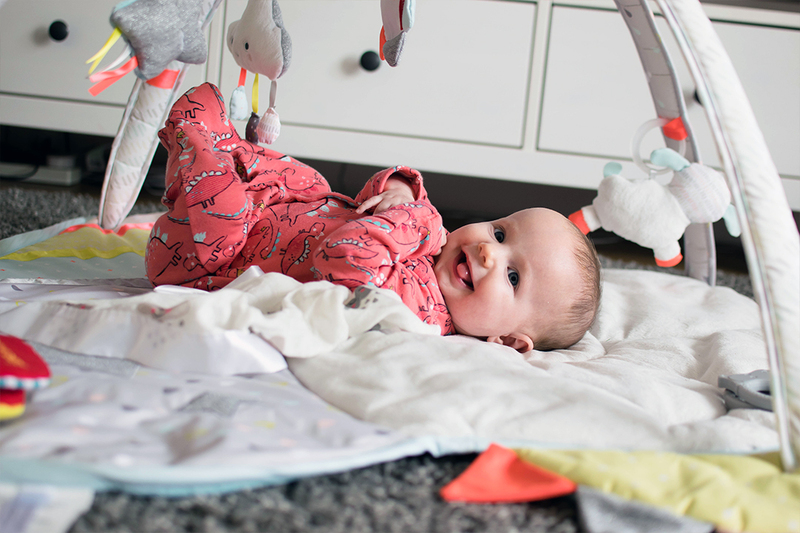 The mat is also BPA-free, PVC-free, Phthalate-free, so you know there are no nasties when you lay your precious newborn down to play. There are so many benefits to having a good activity gym. From getting down on the floor and spending some precious one to one time with your baby. 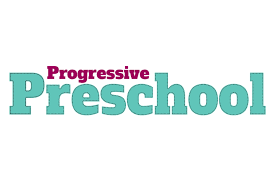 To putting your feet up and enjoying a hot cup of tea whilst they learn how to entertain themselves and be independent. 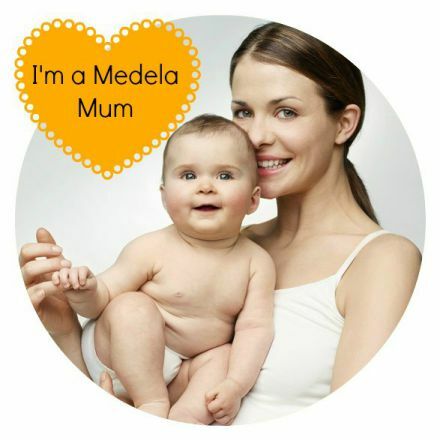 Aside from things like her bed and pram it’s probably one of our most used items. It’s like a part of the furniture. But it also folds flat with ease, we store it underneath the sofa! 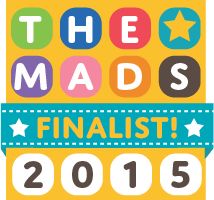 We use the Skip Hop silver linings activity gym with Harriet on a daily basis. It’s a nice safe space to lay her down whilst I get things done and it keeps her happy. 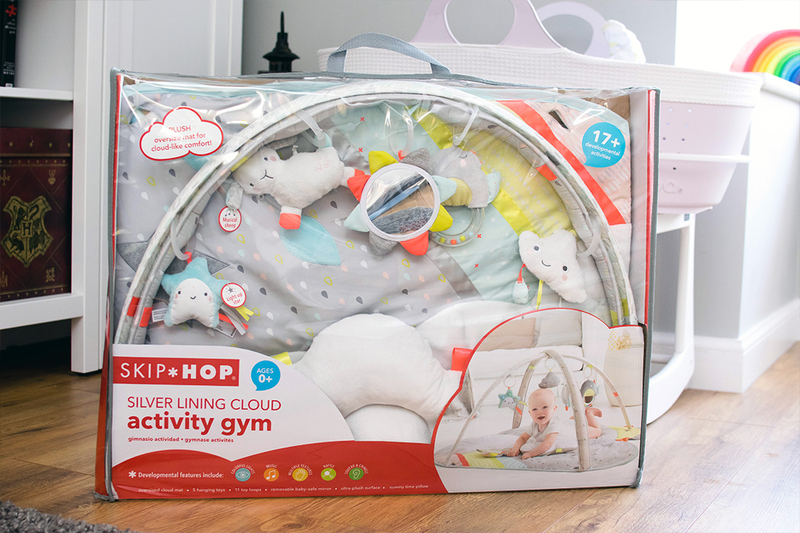 You can purchase the Silver Linings Activity Gym along with a range of great Skip Hop products at Amazon and selected retailers.